In The Backbone of England , Andrew Bibby walks the route of the Pennine watershed separating the water flowing westwards to the Irish Sea and the Atlantic from the water heading towards the North Sea. Keeping always above the headwaters (the golden rule in following a watershed is never cross running water) he travels from Edale and Kinder Scout in Derbyshire as far as Hadrian's Wall in Northumberland. 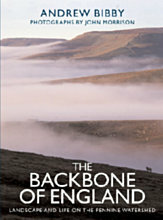 The Backbone of England is partly a travel book, partly a celebration of a fine stretch of countryside but primarily a journey to discover more about the landscape in this part of England . Andrew Bibby offers a range of keys which aim to open up an understanding of the social and economic factors which make the Pennine landscape as it is, exploring what has happened in the past and, particularly, what is going on up in these hills today. These extracts (PDF format) will give you a taste of the book. First edition published in hardback March 2008, by Frances Lincoln Ltd.
Revised and updated edition published in paperback March 2011. BUY ON-LINE.